Helen Reed & Hannah Jickling in collaboration with Queen Alexandra Elementary Students. International CDN $10.00 (pricing includes shipping and handling + taxes.) International orders here. 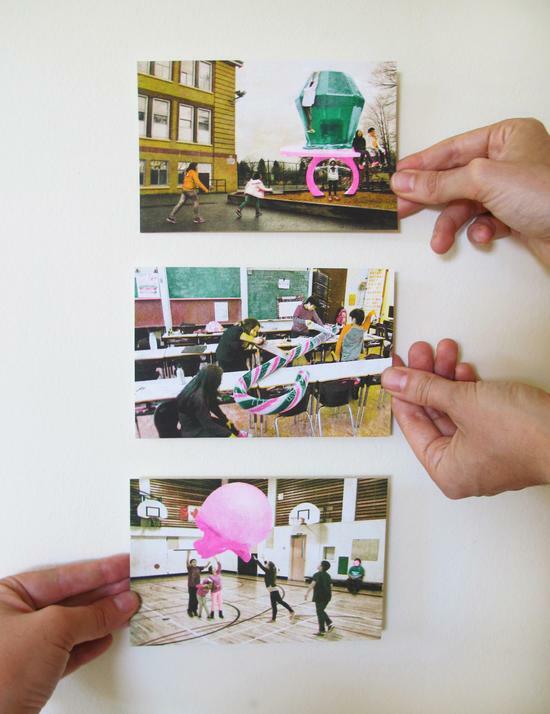 Taking place over the course of a multi-year residency with Queen Alexandra Elementary School (located at Clark and Broadway in East Vancouver), Big Rock Candy Mountain expands traditional notions of public art. The project is disseminated serially, through artist editions, printed matter and collaborative confections that inhabit various venues and address multiple audiences. Tall Tale Postcards were the first edition in the series of published works from Big Rock Candy Mountain. The culmination of four months of comic-utopic exaggeration and surrealist image-making with a class of grade 4/5 students, these postcards were risograph printed by Color Code in Toronto.